I loved his last question…it really cuts to the heart of the matter. A recent informal survey I conducted among a few filmmaker colleagues revealed that most long form docs are edited over 4 months, many over a year and some over as long as 5 years. How do you create a system that allows you to be able to find that one favorite soundbite or image on the last week of the edit as easily as you found it on the day you logged it? Here were my recommendations to him…what would you add to this list of things to consider? In response to his first question, I think the director has to look at everything and determine what is relevant. How does the material “hit” you…how strong is it and to the point of your subject? 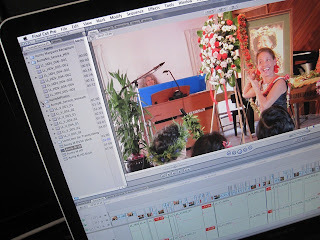 As editor, I rarely see 100% of the footage (there usually just isn’t enough money or time…although by the end of the edit, I’ve often seen most of it…it depends how much footage we are talking about). Often I’ll ask the director to start off by just showing me their “star” takes…or the best 30 – 40% of the footage. But sometimes a director will want to screen whole interviews with me…this is really a time/money issue. This way, every media file has a unique name, and the media file name precisely matches the clip name. For me, matching the clip name and the media file name are crucial to long term media management success. The specific content of the clip name depends on what’s important to you….the date it was shot? The location? The character’s initials? This can all be encoded as part of the clip name. Consistency is key. I use “Master” Bins to first organize the clips by tape or groups of tapes, so I can find things in tape order or chronologically. I then make additional work bins to organize material by type: Music, Voiceover, Interviews, Interviews by character, Clips by scene, clips by location, archival, archival by subject, etc. It really varies depending on the project. Then I use a combination of Markers and the Log Note & Description fields in the FCP Browser to write additional logging information about shots. If I have time, I’ll sub-clip material to further break it down and log and organize it. You can always make more bins, and create bins of bins to better organize as you go. Generally, I love having every bit of interview material transcribed and transcripts printed and in binders. Often the director and I have our own separate sets of binders so we can each scribble and write on the transcripts. I also want the transcripts as word documents, or as one giant word document so I can search for keywords. Often the director will use these paper transcript to literally circle the best takes when they review footage, and create the first subset of “star” takes for me to watch. My biggest advice to you is this: By all means make a duplicate set of media and put it in a safe place. I recently had a brand new out of the box, 1 week old, 4 TB G-Raid, fully loaded with media, just stop working. It would no longer mount, and the only recourse was to send it back to G-Raid, who took a month to replace it because it was out of stock! So on all documentary projects, once I have all my media loaded, I make an exact duplicate of that media, and put it on a shelf (it’s an assistant’s job to be sure to duplicate all additional media, once a week). That way if a drive goes down, you have a back up on the shelf, and you are back up and running in minutes. The best insurance any edit room can buy…and cheap! The filmmaker also mentioned that he was setting up his projects according to this very good article by documentary editing teacher and author Karen Everett. Worth a read.